The Polina polished nickel large crystal table lamp with beige shade, featuring large crystal elements, an opulent lighting range featuring a highly polished nickel finish and 24% lead crystal spheres. 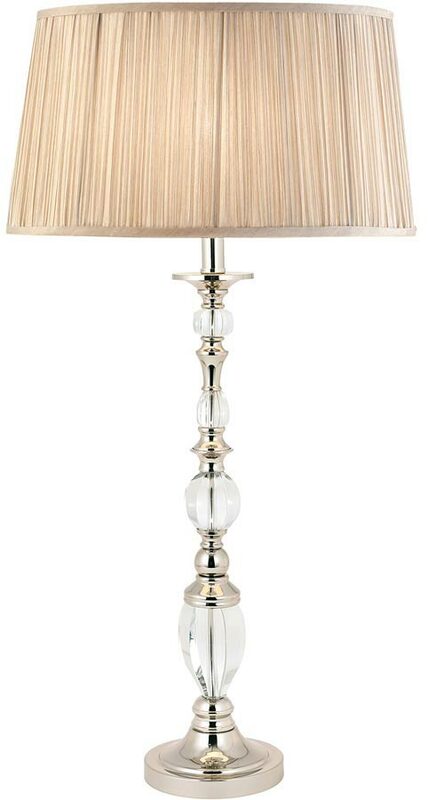 A stunning medium sized crystal table lamp in highly polished nickel, with a classic flared base and stem made from crystal spheres and polished nickel detail. Supplied with an oval, beige faux silk 17-inch pleated fabric shade as shown and fitted with an inline switch. An elegant, large and impressive addition to any room. Finished in highly polished nickel and adorned with k9 crystal glass detailing to give it an opulent feel. Suitable for use in living areas, hallways and reception rooms. The Polina polished nickel large crystal table lamp with beige shade, part of the New Classics collection, designed and manufactured by Interiors 1900.